There's a great article about Howdy Houghton in Orion magazine. And online version can be found here: A Voice for Downeast Maine. Howdy is a great guy and an extremely valuable member of COA and the broader community. It's awesome to see him get some well deserved praise. And there's a nice article about COA student Margaret Longley in the online version of the San Juan Journal. And then there's this snarky piece from the Wall Street Journal: Heaven Sustain Us: Environmentalists Have Taken Over the Dorms, by Naomi Schaefer Riley. I must be getting old and grouchy, because I actually agree with some of the points she raises. The WSJ piece reminded me of What’s Wrong With “Social Justice”? by Tim Burke. Tim wasn't writing about COA (this was before he had visited), but he might have been. 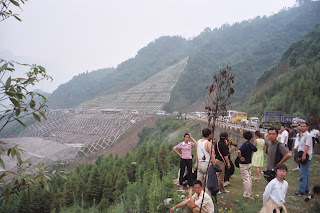 In the summer of 2005, Doreen and I traveled for a few weeks in Southwest China, including Sichuan, where there was a very large earthquake a few days ago. We spent most of our time on the Tibetean plateau in Qinghai, Gansu, and Northern Sichuan provinces. But toward the end of our trip we took a long bus ride from Northern Sichuan down to Chengdu, which is the capital of Sichuan and is in the central part of the province. This route took us right through the area near the epicenter of the earthquake. I looked through the photos from the trip and found the picture shown above. I took this during the bus ride to Chengdu. There had been lots and lots of rain, and mud and rockslides closed the road at times leading to large delays. This picture was taken during one such delay, when almost everybody got out of their vehicles. In the distance along the road you can see some small wooden shacks. These were probably temporary housing for workers doing road construction. The road, so far as I could tell, was the only even remotely major road heading north out of Chengdu. You can see from the picture that the road was built into a pretty steep hillside on which there had been considerable erosion. The road follows a river out of the mountains for most of its descent from the plateau. So it's easy to imagine all sorts of mudslides blocking the road, making it difficult to get resources from Chengdu north to the area that is hardest hit. There are also numerous tunnels through the mountains. Again, I could easily imagine that the tunnels were damaged in the earthquake. Chengdu itself was a pretty nice city. It's huge--around ten million people--but it's surprisingly mellow for a city of this size. Doreen and I had a pleasant few days there. After a bunch of time on the road and some fairly primitive accomodations, it was nice to be at backpacker hotel with good showers and cold beer. We also saw many pandas at the zoo, which was very cool. Anyway, the situation in Sichuan sounds horrible. There are lots of stuctures in China, especially outside of the cities, which appear to be rather poorly built. I'd guess that the cities and towns north of Chengdu suffered incredible damage. The big news is that on Saturday we got two new kittens! A picture of them is above, and many more pictures can be found here. We got them from an SPCA in St. Stephen, New Brunswick, which is right across the border from Calais, Maine. The New Brunswick SPCA was the first one that had kittens available, so we made the drive. We picked the kittens out a few weeks ago, and I drove and got them Saturday after they were spayed/neutered. So far they seem to be adjusting to their new home quite well. They seem quite at ease. They play, wrestle with each other, eat, and sleep. We haven't introduced Monster (our big, older cat) to them yet; the kittens have been confined to my office. But Monster can tell that there's something moving around in the office, and she seems surprisingly calm. So I think things bode well. The shelter got an entire litter of kittens and gave them all names starting with "A". The little gray girl is called Apple, and I think we'll end up keeping that name. The orange guy was called "Archibald", which will definitely go. But so far I haven't come up with anything better than Orange Guy. Suggestions are welcome. But I don't think we'll call him simply "Orange." This seems too obvious. It's cold and grey today, but this was the scene yesterday in our backyard. Colorful finches continue to mob our birdfeeder, and the lawn needs mowing. Spring is here, even if I did just build a fire to take the chill off. I think I'll go exercise, and then make some dinner. I might have some tofu dogs that I bought earlier today. Doreen dislikes tofu dogs, but she's currently in Germany, so there's nobody to stop me from purchasing and eating tofu dogs and enjoying it. Spring is definitely here. Trees and flowers are blooming, and the leaves are almost out. There are gold finches and house finches at our bird feeder, and I think I will need to mow the lawn this weekend. The weather has alternated between beautiful, so that all I want to do is sit around and savor the warmth and the green, and cold and rainy, so all that I want to do is sit around because it's cold and rainy. So it hasn't been a record-setting week of productivity. Tim Burke visited COA earlier this week. I've been a fan of his blog for a long time, and it was great to get to meet him in person. He gave a talk on Monday titled, "Long Tails, Network Hubs, Creative Destruction: How to make a Liberal Arts college in the 21st Century without trying (much)." His presentation was interesting and thought-provoking. Faculty and students found it to be a very accurate and illuminating view of the challenges and opportunities facing COA. Some of Tim's reflections on COA can be found in his current blog entry, generously titled Brains in Maine. Conversations with Tim and others have highlighted for me some of the challenges and intellectual bottlenecks COA is experiencing at this particular moment in its history. This isn't necessarily a bad thing, but it is tiring sometimes. But at least we're not giving Phyllis Schlafly an honorary degree. Ug. 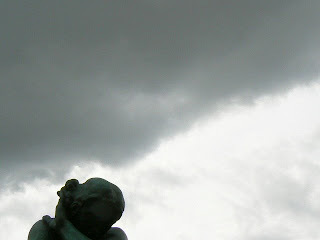 Here is another picture of a statue and the Parisian August sky. The statute is "Meditation avec Bras" by August Rodin. Looks like Forbes.com thinks COA is one of the ten greenest colleges and universities.